I had never heard of Georges Orwell for something else than 1984 before this week. Lisa from ANZ Lit Lovers recently reviewed ‘Down and Out in Paris and London’ and I have added it to my list after her review. What you write confirms it is interesting. I haven’t read Down and Out in Paris and London and that’s the one I want to read next too. Have you heard of Albert Londres? You may be interested in reading his books too. I’ve just bought “Promenades dans Londres” (Walks in London) by Flora Tristan. She describes the life in London in 1840. She visited the poor neighbourhoods too. It seems interesting, I plan to read it soon. No I haven’t heard of Londres. Off to investigate. Thanks! Fantastic review Guy. I really admire the way you make the both the life and the book about it so compelling (as also in your Simenon bio review). Some really striking quotes here. The Emma Larkin book sounds well worth checking out as well. I agree with you: Orwell is a giant and his voice continues to have weight and relevance. I’ve read some but want to read much more of his stuff: Burmese Days and Shooting an Elephant are on the wishlist. I have Keep the Aspidistra Flying to read which I hope will make an interesting companion / comparison with Patrick Hamilton. 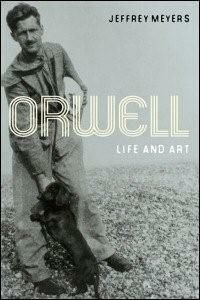 The author has some intense parallels between Orwell’s life and the lives of his fictional heroes–I thought esp. when it came to Gordon Comstock (Keep the Aspidistra Flying). There’s a film version of that BTW. Anyway, I have my favourite passages marked to return to. I’ve got to get back to Hamilton…. Great post Guy on what sounds like a fascinating book. I have read a bit of Orwell – novels, memoirs and essays – and plan to read more. I too like the idea that we “need Orwell more than ever”. I have the Emma Larkin book but hadn’t read much about it. You have enthused me to levitate it up the pile. The title of the Larkin book reminds me of another I read a few years ago: In the Footsteps of Mr Kurtz by Michela Wrong. It’s an account of the latter years and collapse of the Mobuto regime in Congo / Zaire. There’s no real literary connection beyond the title but it’s well worth a look. A similar aftermath-of-colonialism theme applies. Looked up the book you mentioned and it sounds excellent. As a teenager I used to love Orwell, I read tons by him, though never Down and Out as it happens. I was hugely impressed by Homage to Catalonia, but I loved best Keep the Aspidistra Flying. The subject was outside my experience, but the truth in the story was evident and it held real power for me. This sounds great, though I’m not generally a reader of lives. Nice review though Guy. It reminds me I should revisit Orwell, and Aspidistra. An Aspidistra/Hamilton comparison would be interesting. Any odds on your throwing Maclaren-Ross into the mix? Orwell’s complete essays and letters make for compulsive reading. As a stylist, I have always admired his tremendous simplicity, clarity, and directness. I try to imitate him in my expository writing. I’m sure I fail miserably, but his prose is my signpost. Orwell’s take on film was both interesting and amusing. It was as if he considered it largely worthless. Can’t help but wonder what he’d make of the big Hollywood blockbusters these days–I’m sure he’d hate them. Max, I’d love to, and I look for him every time I’m in my local but alas no sign. So it’s Book Depository to the rescue (again) – but I’ll hold off I think till I read the Orwell. Lichanos: Yes I know what you mean. When I read about some of the harsh conditions he put himself into (with TB), I concluded that he had some desire to punish himself.